Compared to modern SF novels the length of this book might almost be closer to being a short story than a novel but Zelazny does mange to pack more ideas into a short space than many other manage in much longer works. The main character, Render, is a dream therapist who works by manipulating the dreams of his patients to turn them into immersive experiences where Render shapes the dreams to help his clients gain new perspectives on their issues. This is a perilous occupation since if the therapist gets too involved in the dreams they are creating then they risk their own sanity. Render is one of the best in the world at what he does, however in this book he takes on his biggest challenge to date as he takes on a blind woman (and aspiring dream therapist) as a patient who wants to experience seeing in her dreams what she can never see in reality. 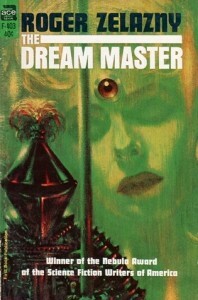 The novel being partially set in various dreams that Render has created does allow for some memorable scenes and there’s also plenty of imagination shown elsewhere in the world Zelazny describes, particularly memorable is a guide dog with an enhanced intellect and some genetic modifications allow him some ability to speak whose personality is an intriguing mix of canine and human. Occasionally the technology does feel a bit dated (the book was written in the 1960s) but most of the time it doesn’t detract from the story. I think Zelazny is one of the genre’s best writers of prose and there is some very good writing in here. The plot is also intriguing but some parts of it are perhaps a bit underexplained and the ending feels rushed and unnecessarily vague in terms of describing what exactly has happened. I’m also unsure about the purpose of some of the scenes and subplots, particularly concerning Render’s precocious son whose visit to an exhibition on interplanetary travel feels a bit disconnected from the rest of the novel. There is some good characterisation in here, particularly of Render and his patient although the supporting characters mostly don’t get much depth. Overall, I’d say this was a good book but not one of Zelazny’s best works, compared to a masterpiece like “Lord of Light” it feels as if it wasn’t quite as good as it should have been.